The final two recipes in the Puff Pastries section of the Modern Baker Challenge were among the easiest. They are also the best argument I can think of for keeping puff pastry in your freezer at all times. With puff pastry on hand, you can have these delicious snacks baked and ready to eat in no time. Unlike my friend Margaret, who set out to make salt and pepper straws and ended up making cheese straws instead, I set out to bake salt and pepper straws and ended up making both. These were so easy to make. 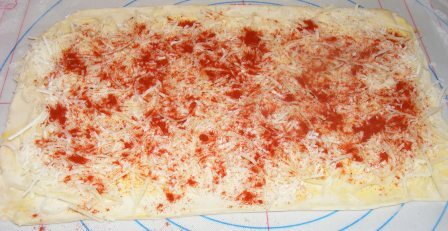 I rolled out the puff pastry, spread half of it with egg wash, then covered half the egg wash with salt and pepper, and the rest with cheese and paprika. The recipe called for salt with the cheese, but when I made them previously, I found the cheese straws a bit too salty for my taste. Normally, you would cover the egg wash with either salt and pepper or the cheese mixture, but I was making a half batch of each. If that looks like a lot of salt and pepper, it is. In fact, I thought it might be a bit too heavy on the salt. But I like to follow the recipe the first time I make something, so I stuck with the amounts given (cut in half to account for making a half batch, of course). The cheese straws were delicious. Without the additional salt, they were perfectly savory, cheesy, and, yes, salty. The pepper in the salt and pepper straws was just right, too. It gave them the right amount of bite but didn’t overwhelm the other flavors. I did find them a bit too salty, as did my tasters. Next time I think I’ll cut the salt in half, and I bet they’ll be perfect. Although we have launched headlong into the Cookies, Bars & Biscotti section of the Modern Baker Challenge, I still have a few blog posts to finish up in the Puff Pastries section, including this one. I made this recipe quite some time ago; it has just taken me until now to upload the pictures and post it. This is a rich, savory hors d’oeuvre, perfect for a fancy cocktail party or as an appetizer for a dinner party. And as fancy as it looks, it’s really easy to put together. 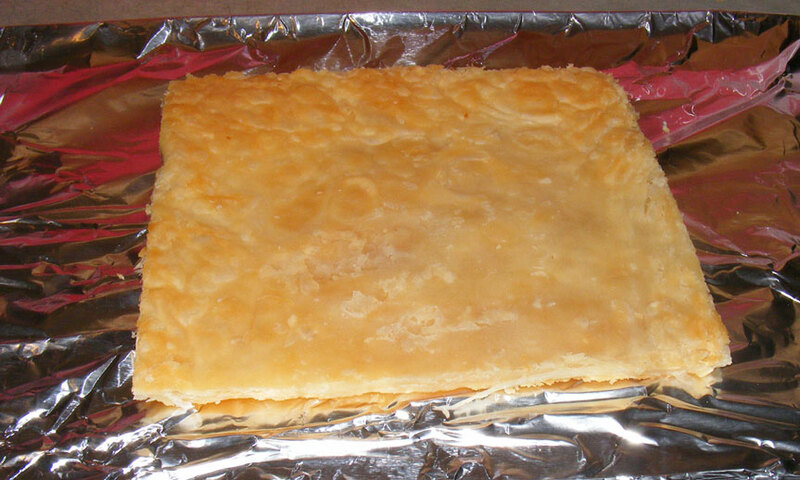 I started with a baked puff pastry layer made using homemade puff pastry. 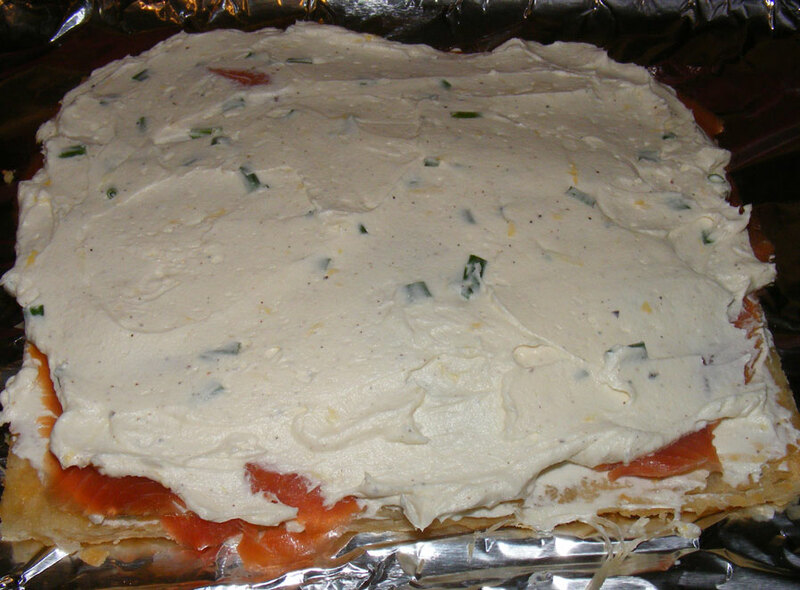 I layered the baked pastry sheet with smoked salmon and a mixture of cream cheese, butter, and chives. This was really delicious. 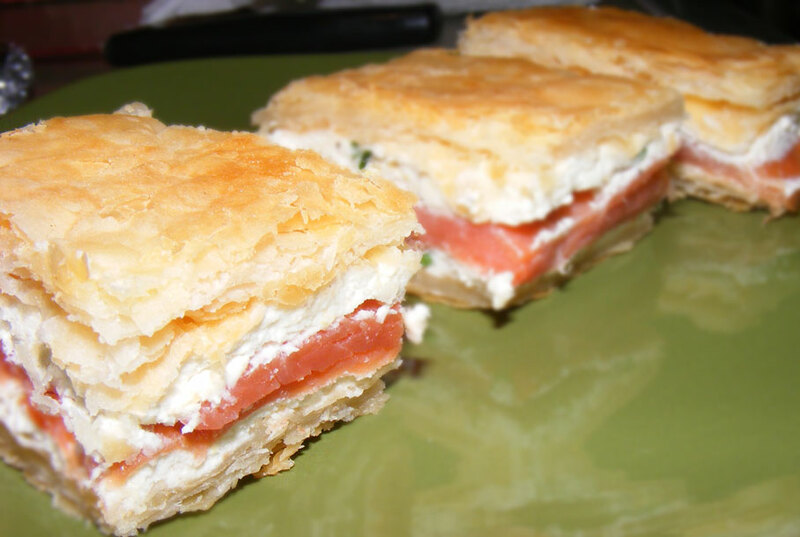 The salty, smokey salmon played well against the rich puff pastry and filling. The only thing I would do differently next time would be to cut the portions smaller, as the pastry and filling are really rich. Of course, that didn’t stop me from eating several of the them. If you need an appetizer to put out with drinks at the start of a nice dinner party, this is an easy hors d’oeuvre with tons of “wow” factor. Just be sure to cut them small. And don’t put out too many of them, or your guests might not be hungry for dinner. This week’s recipe for Modern Baker Mondays is another savory offering. And as excited as I was about making the Caramelized Onion & Gorgonzola Tart last week, I was kind of so-so about these Spinach & Feta Turnovers. 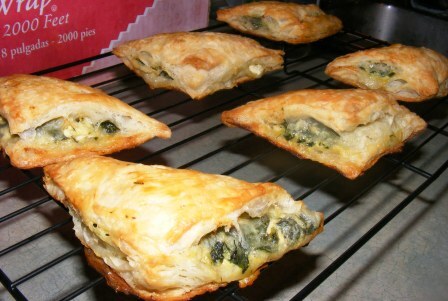 I love turnovers; I could live on spinach (I’ve loved it since I was a child); and anything made with puff pasty is OK in my book. So I wasn’t sure what exactly was holding me back. Then it occurred to me: I don’t really like feta. There, I said it. Call me a rube, call me a blasphemer. I’m just not that crazy about the stuff. I don’t hate it, and I even make things with it from time to time. But I often find it so bitingly acidic that it overpowers every other flavor and texture in the dish. I even thought about substituting goat cheese or blue cheese in this recipe, but I decided to make it as Nick intended. I found a somewhat mild feta, and I hoped that baking it into the turnover would tone it down even more. 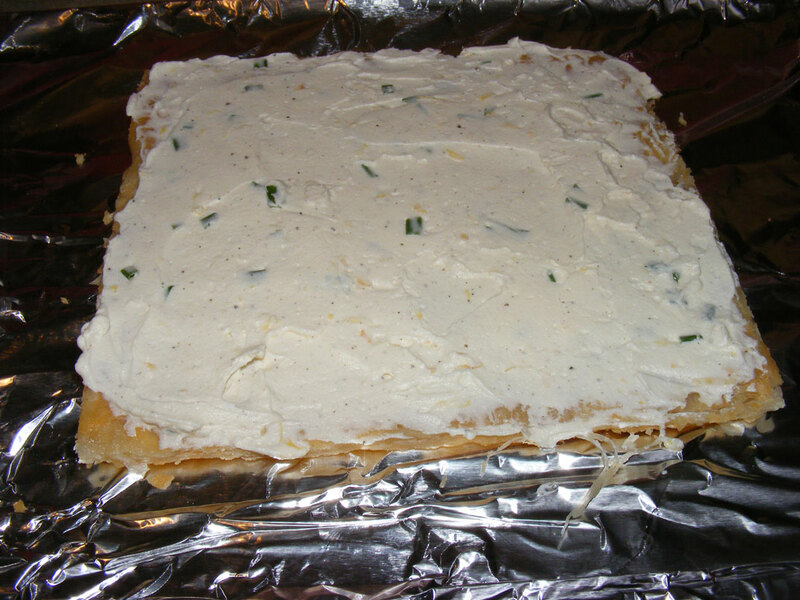 After rolling out the puff pastry and putting it in the fridge to chill, I began assembling the filling. 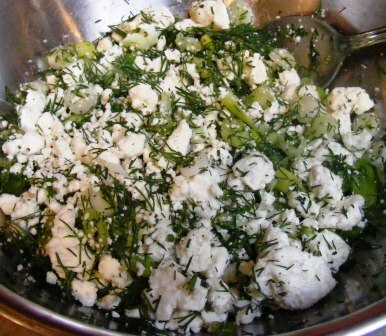 I started by mixing dill, green onions, feta, and pepper in a bowl (no salt, as the feta is plenty salty on its own). 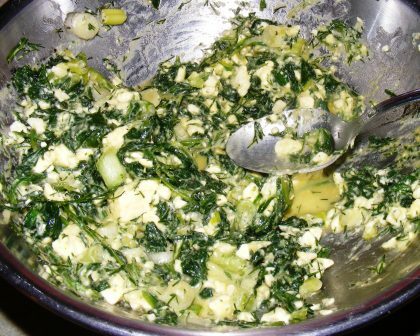 I set the feta mixture aside while I sautéed spinach in olive oil until it had wilted and cooked down considerably. It wasn’t until I was finished cooking the spinach that I read the part of the recipe that says to chop the spinach before you sauté it. 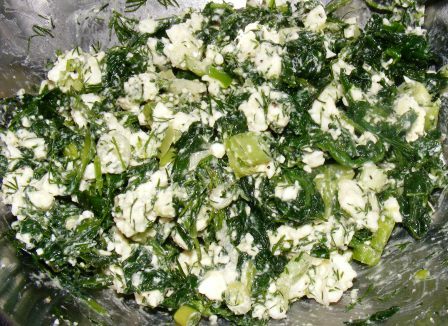 No matter: I grabbed my kitchen shears and chopped it in the pan before adding it to the feta mixture and stirring in an egg. Now it was time to assemble the turnovers. I got the dough out of the refrigerator, lined a baking sheet with Silpat, and made an egg wash with beaten egg and a pinch of salt. 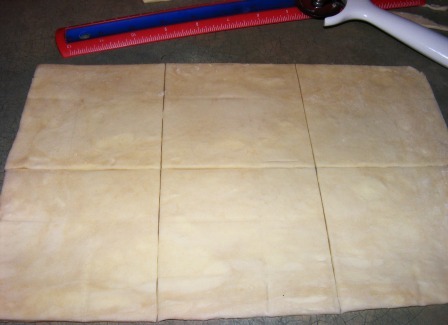 I cut the edges of the dough straight, then divided the dough into six squares (I made a half batch). 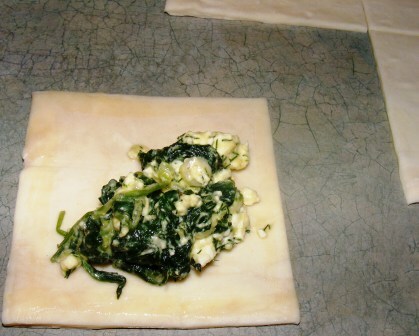 To make each turnover, I brushed the edges of a square of dough with egg wash, then put a dollop of filling near one of the corners. 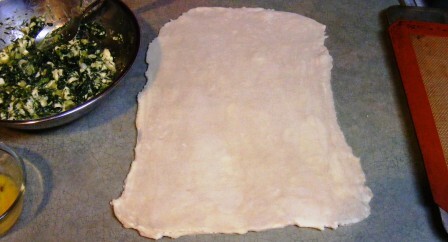 I folded the corner over, then sealed the edges by pressing the dough together with my fingertips. I was surprised by how much filling I had left after making all 6 turnovers. I thought about saving it for something else, but in the end I just pitched it. I baked the turnovers at 375˚F for 15 minutes, then turned the pan around and baked for another 10 minutes. Feta or no, the turnovers smelled really good baking, and I could hardly wait to try them. And I was delighted and surprised by the taste. The puff pastry was, of course, buttery and flaky. And the filling tasted of spinach and onions and only a bit cheesy, but not in a bitingly acidic way. If it hadn’t been part of the puff pastry section of the Modern Baker Challenge, I doubt that I would have made this recipe. 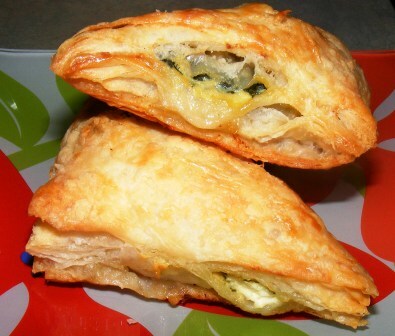 But having tasted these delicious turnovers, I’m sure I’ll be making them again. I almost skipped this week’s French Fridays with Dorie recipe, as I knew no one else in the house would eat it. But it sounded good to me, so I decided to make a mini version for myself. Although this recipe comes from the Nice region of France, it’s very similar to Focaccia alla Barese, an Apulian specialty from Southern Italy. 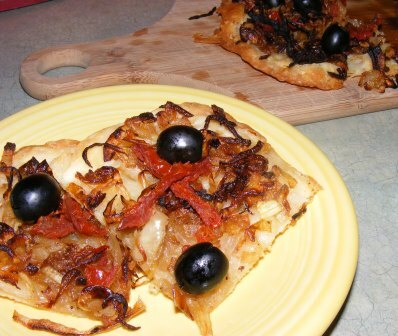 Both feature onions, anchovies, and olives baked on a yeast-risen dough. 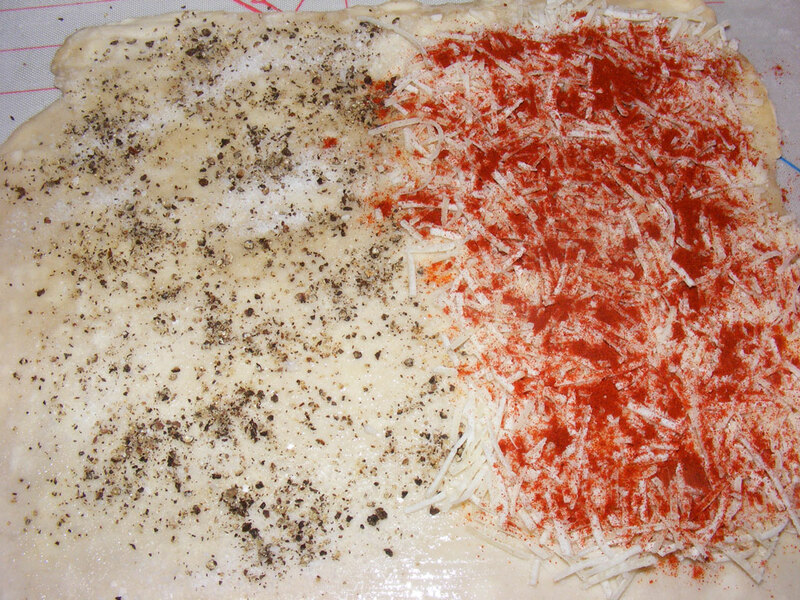 I’ll let the French and Italians fight over who first came up with this recipe. What I can tell you is that I enjoyed them both. 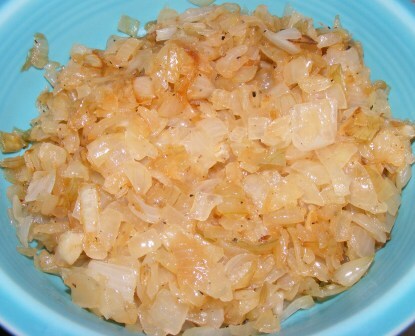 The recipe features caramelized onions. 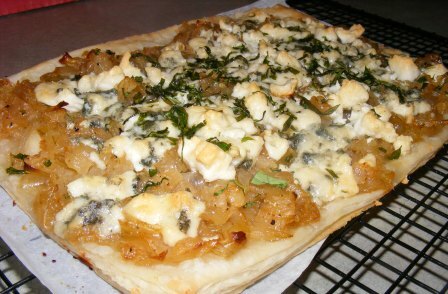 This must be the week for it, since I made a Caramelized Onion and Gorgonzola Tart for Modern Baker Mondays, too. 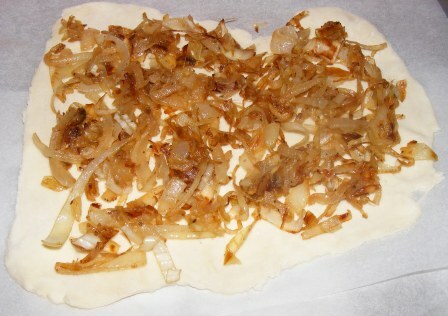 Unlike the Modern Baker version, which “enhances” the onions with sugar and balsamic vinegar, the pissaladière recipe calls for caramelizing the onions the old-fashioned way — with nothing but olive oil, salt, a few herbs, and lots and lots of time. After almost an hour over low heat, the onions were beautifully caramelized. I stirred in anchovy paste (the recipe called for anchovies, but all I had was paste; more on that later) and freshly ground black pepper. I tasted the onions and decided they didn’t need any additional salt, as the anchovy paste was plenty salty. I set the onions aside to cool while I prepared the crust. 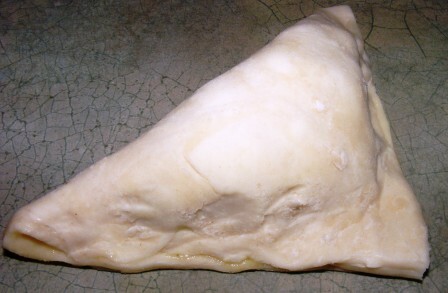 The recipe has instructions for making a yeast-risen dough, but Dorie also notes that it can be made with puff pastry. 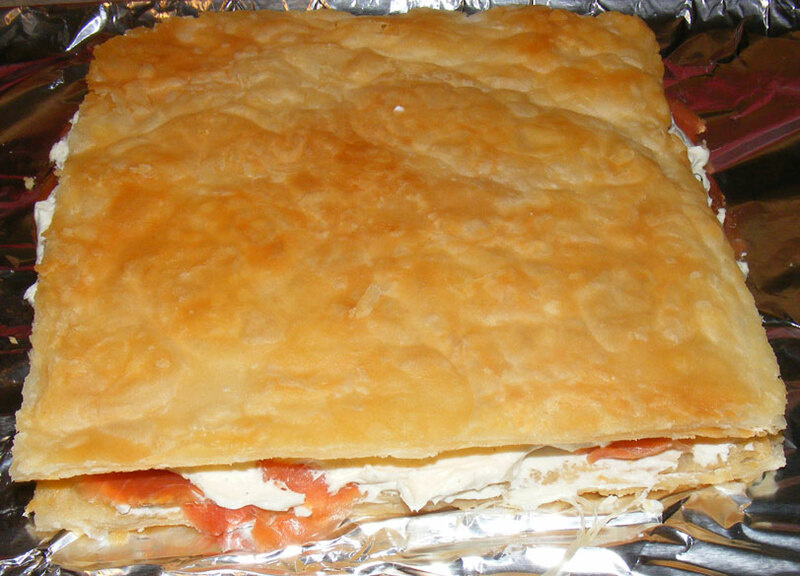 Since I had some puff pastry in the refrigerator, I decided to use it. I rolled it out nice and thin, trying to get it into a roughly rectangular shape but not worrying too much about perfection in that regard. 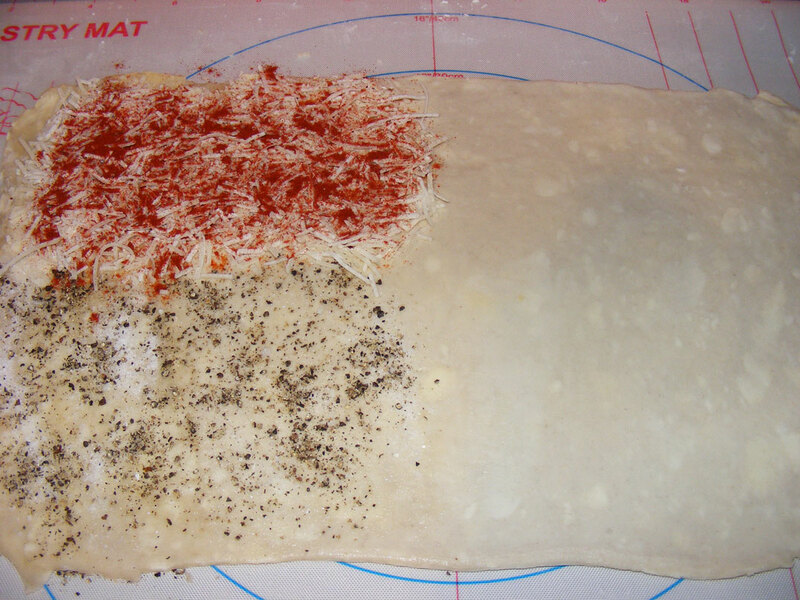 I spread the dough with the onion mixture, then slid it into the oven, which I had preheated to 425˚F. 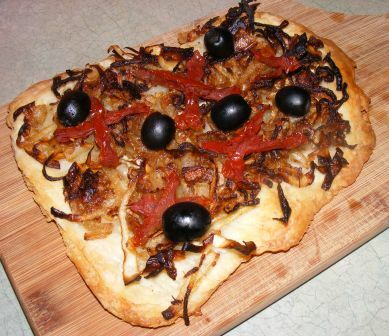 I baked the pissaladière for 20 minutes, then took it out of the oven and added black olives and sundried tomato strips (in place of the anchovies called for in the recipe). I returned the pissaladière to the oven for about 5 minutes, just to warm the new toppings. It has been almost a year since I made Focaccia alla Barese, but the pissaladière tasted just as I remembered the focaccia tasting, which is to say, delicious. The focaccia had a much thicker crust, but otherwise the two were very similar. 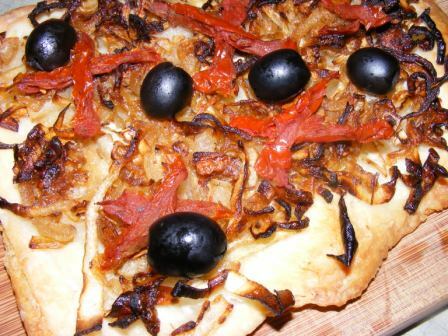 The sweet tang of the onions played nicely off the saltiness of the anchovies and slight bite of the olives. This is not a dish that I will make often around here, as I’m the only anchovy eater in the house. 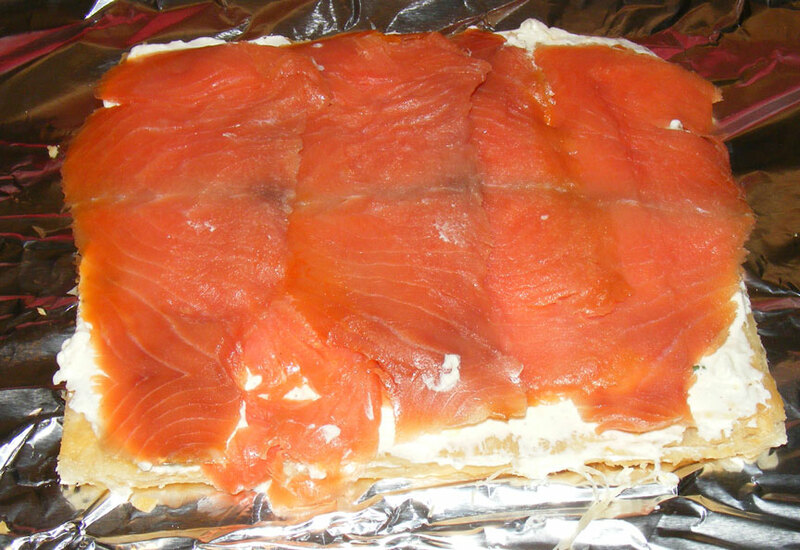 But I could see making it as an appetizer for a dinner party, or even a light lunch for my fish-loving friends. No, this isn’t a recipe for oxtail stew from the other end. Ox tongues are pastries, similar to elephant ears or palmiers, made by rolling puff pastry in sugar and baking until the sugar caramelizes. The shape is what sets these pastries apart from their counterparts, and is also where they get their name. 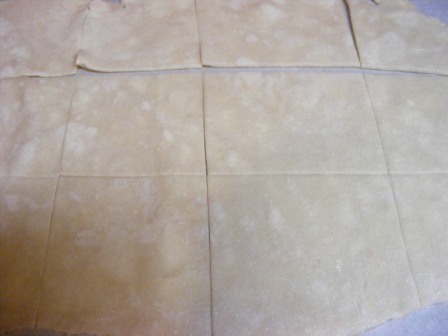 You begin by rolling out puff pastry dough, then cutting it into rounds. After chilling the rounds, you dredge the rounds in sugar, then roll them out in to an oblong shape, rather like an ox’s tongue (use your imagination here, people!). These were really good. They were almost more like a little cookie than elephant ears, which have layers of sugared pastry, but the taste was about the same. I chose these Ox Tongues as my pick for our informal Bake! group, hosted by Kayte. I made them quite a while ago, but didn’t get around to posting them, as I somehow lost my photos. I thought I might make them again before time to post the recipe, but no such luck. You’ll have to trust me that they were delicious and looked really good. And only slightly resembled an ox’s tongue. This week’s Modern Baker Mondays recipe veers sharply away from the sweet puff pastry recipes we’ve been making recently to bring up something savory, tangy, and, OK, a little sweet. 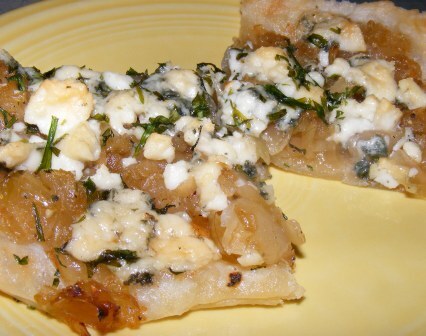 The combination of caramelized onions, blue cheese, and tarragon is genius. These flavors play off one another to bring out the best qualities in each of them. As with all the recipes in this section, this tart is built on a crust made of puff pastry. The full recipe makes a 12 x 15-inch tart. I wanted to halve the recipe, so I used a 6 x 7 1/2-inch pan, right? Wrong!!! I used an 8 x 11 1/2-inch pan, which is very close to half the size of the jellyroll pan called for in the recipe. How, you say? Let’s do the math. A 12 x 15-inch pan has a surface area of 180 inches (12 x 15 = 180), half of which is, of course, 90. And 8 x 11.5 = 92; pretty darn close to 90. So, I used half the puff pastry called for in the recipe, rolled it out to fit the pan, and stuck the crust in the fridge until I was ready for it. 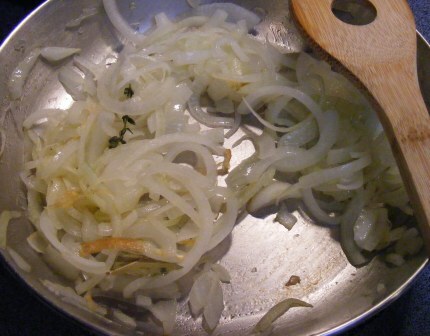 Next, I prepared the caramelize onions. There are two basic methods for caramelizing onions — the real way, and the fake way. 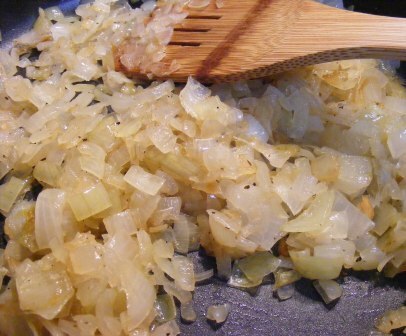 The real way involves cooking the onions over very low heat in butter or oil with a pinch of salt for a long time (upwards of an hour). 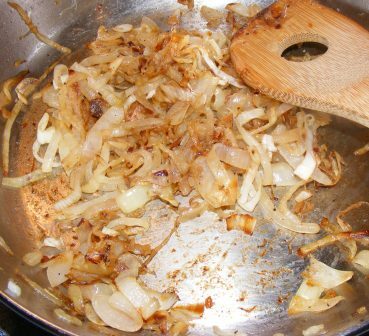 The “fake” way, which really doesn’t involve caramelizing the onions at all, is to sauté the onions in butter or oil and add sugar and balsamic vinegar to mimic the color and flavor you get when you caramelize onions. When I read the ingredients to this recipe and saw that it called for both brown sugar and balsamic vinegar, I figured we’d be faking the caramelized onions. But then I read the recipe and saw that the onions are cooked over low heat for 40 minutes, and I realized that Nick had combined the long, slow cooking and natural caramelization with sugar and vinegar for added flavor. I should know by now to trust him, shouldn’t I? The onions looked and smelled wonderful while they cooked. And the flavor was as good as any caramelize onion I’d ever had. With the crust and caramelized onions at the ready, all that was left to do was crumble some blue cheese and chop fresh tarragon. 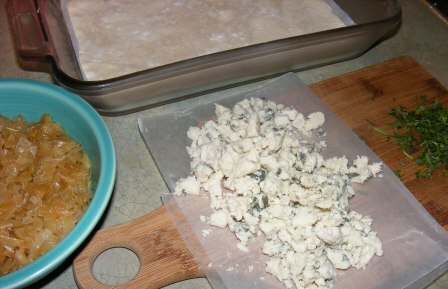 I used a mixture of chevre blue and buttermilk blue for the cheese. The goat blue was firm and very flavorful; and the buttermilk cheese was soft and tangy. To assemble the tart, I poked the crust with the tines of a fork, spread the caramelized onions over the crust, added the blue cheese, and sprinkled on the tarragon. It seemed to be heavy on the toppings to me, but having tasted the onions, I was ready to trust Nick’s judgment on this one. I baked the tart in a 400˚F oven for about 20 minutes, until the crust was baked through and the cheese had melted and begun to brown. I probably should have let it bake for a few more minutes, as the crust was quite soft when I cut it. I let the tart cool for about 5 minutes, then cut into it. It was so good — the buttery crust, the tang and sweetness of the onions, the bite of the blue cheese, and the sweet, licorice-like flavor of the tarragon, all complemented one another perfectly. Nick bills this tart as an appetizer or first course, but I was perfectly happy eating it for a late-night snack and breakfast the next morning. It would pair well with a crisp, fruity wine. 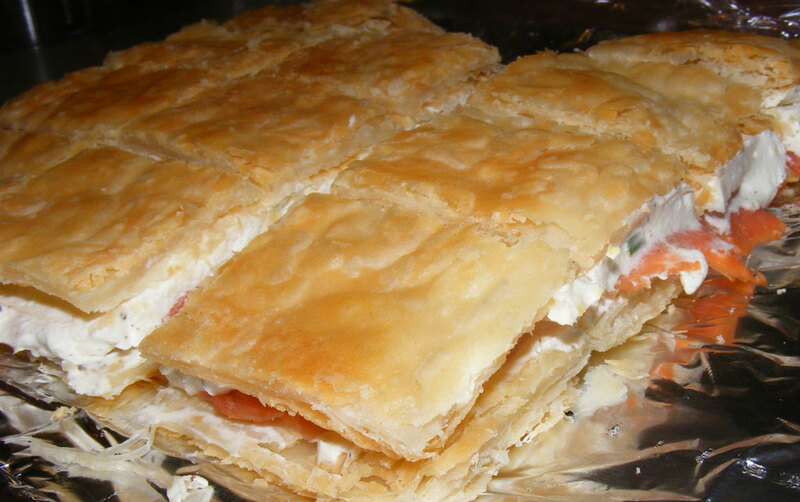 As much as I’ve enjoyed the sweet puff pastry recipes that we’ve made over the past month or so, I have to say that this is among my favorite recipes in this section so far. 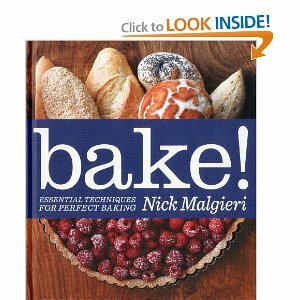 Having made Nick Malgieri’s Perfect Elephant Ears several times, always to rave reviews, I recently thought I would mix things up a bit. 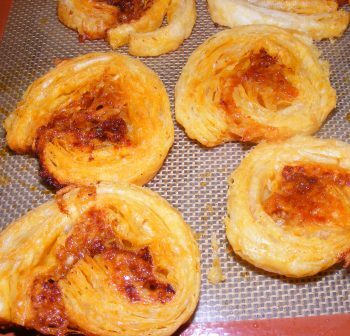 Rather than the sweet elephant ears, made simply with puff pastry and sugar, I decided to make the savory version in The Modern Baker. 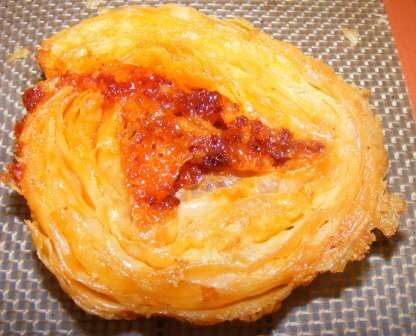 The savory elephant ears were made with cheese and paprika. 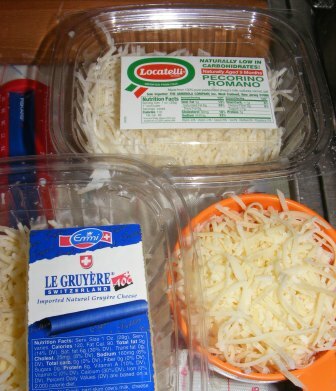 I decided to use two kinds of cheese — Pecorino Romano and Gruyère. 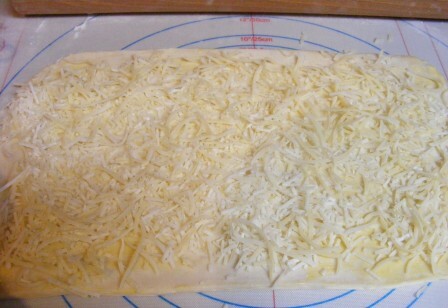 I began by rolling the puff pastry (using flour instead of sugar) into a rectangle. …and sprinkled on some paprika. I shaped the dough as with the sweet elephant ears by rolling the sides in about halfway, then folding a second time, and finally folding one side over the other. 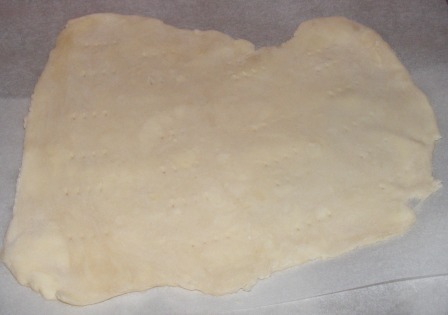 I flattened the roll slightly, then refrigerated the dough for an hour or so before slicing and baking. These elephant ears were puffy, buttery, and cheesy. They reminded me in a way of mustard batons. And even though they were really tasty, calling them “elephant ears” distracted from the experience, as I couldn’t help but compare them to their sweet, sticky, caramelized namesakes. Maybe next time, I’ll just call them cheese puffs. This week’s Modern Baker Mondays recipe is a version of Danish cheese pockets. I recently made the classic version from Bake!, and I was interested to see how these would compare. 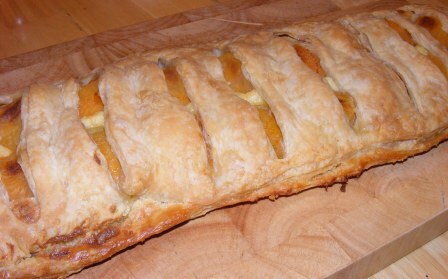 The Modern Baker version uses puff pastry, rather than a traditional Danish pastry. 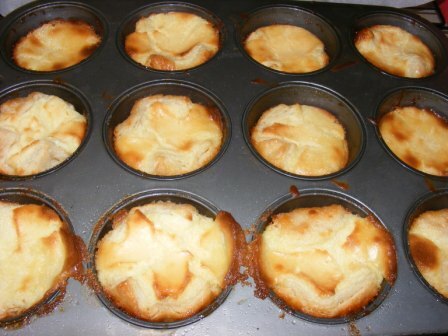 And the Danish are baked in a muffin tin, which helps them hold their shape. I began by rolling puff pastry in sugar, just like when I made elephant ears. Once the dough was the correct size and shape, I chilled it while I made the filling, which consisted of cream cheese, sugar, vanilla, lemon zest, and egg yolks. 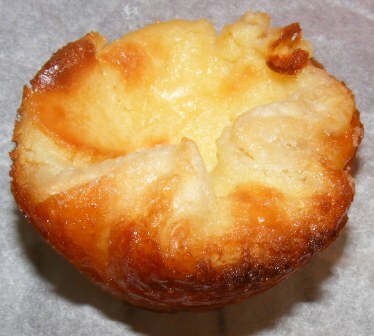 To form the pastries, I cut the dough into squares a few inches bigger than the muffin cups. I pressed the dough into the cups, letting the corners drape to the outside of the cup. 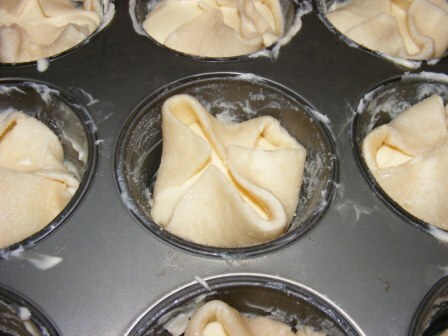 I filled each Danish with cream cheese filling, then folded in the corners so they overlapped. I baked the Danish in a 375-degree oven for about 20 minutes, until the pastry was baked through, the filling set, and the sugar nicely caramelized. These Danish were really delicious, and would be especially attractive to someone who is nervous about shaping a classic Danish. Tastewise, they were fine; but not as good as the traditional Danish from Nick’s other recipe. For some reason, I had a mental block when it came to making this recipe for the Modern Baker Challenge. I’d decide to make it, then decide I didn’t want to, then change my mind again. On and on it went over the course of several weeks. I must have moved the puff pastry from the freezer to the fridge and back again half a dozen times. I even jumped ahead and made Danish Cheese Pockets while trying to motivate myself to finally get to this recipe. It wasn’t until I started putting the recipe together that I finally realized why. Even though he calls these “Swiss” pastries and describes both their Swiss German and Viennese heritage, these crescents reminded me of kifli (or “keeflee”), a Hungarian pastry that my aunt makes every year around the holidays. Now, don’t get me wrong (especially you, Aunt Dar, if you’re reading this); I don’t dislike keeflees. They’re fine. Sweet, nutty, and perfect with a cup of tea. But a few of them go a long way for me. And, like most treats that are only made once a year, no one ever makes only a few of them. No matter whose house you stop by over the holidays, there are plates of them everywhere, and they are offered to you all day long. So, even though I enjoy them well enough, by the middle of December, I would swear I never want to see another keeflee as long as I live. Nonetheless, this was the next recipe in the Challenge, so I would make it, like it or not. The recipe wasn’t difficult, and the ingredients and method were interesting. 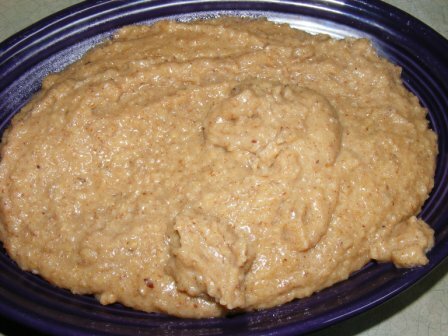 I began by making a paste of sorts out of ground walnuts, bread crumbs (I used crumbs from the less-than-stellar maple walnut scones recipe I had recently made), milk, sugar, butter, and spices. 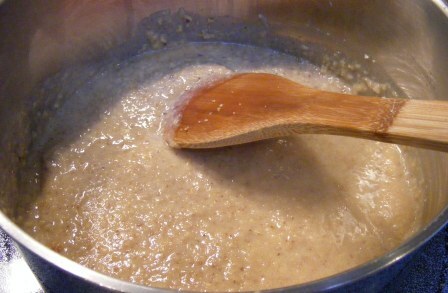 After cooking the nut paste, I spread it out on a plate to cool while I prepared the pastry dough. 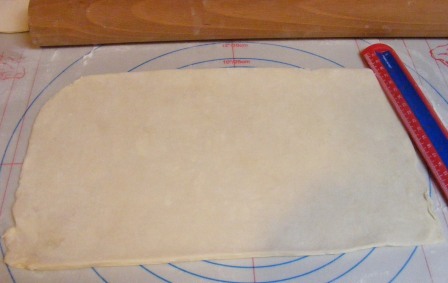 For the pastries, I rolled the puff pastry dough out to a large rectangle, then cut it into triangles. I plopped a spoonful of nut filling on the end of each pastry, rolled them up crescent-style, then put them on a baking sheet. I chilled the dough for a few hours, then baked the crescents at 375°F for about half an hour, until the pastry was puffed and golden. The recipe called for an egg wash before baking the crescents, but I forgot that part. After tasting a few of them and realizing that they really were a lot like keeflees, only better (sorry Aunt Dar), I decided to finish them keeflee-style by shaking them in a bag with powdered sugar. 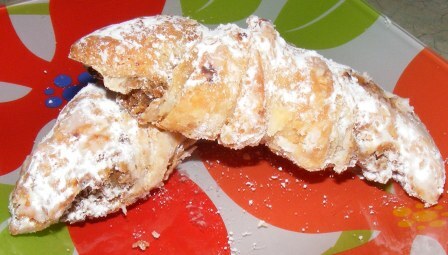 Like keeflee, these crescents beg to be enjoyed with a cup of tea or coffee. They are sweet, nutty, buttery, and just a tiny bit crunchy. The powdered sugar was great with the puff pastry, although J thought it distracted a bit from the buttery flavor. In the end, I was glad I overcame my keeflee-block and finally got around to making these crescents. I made a full recipe, and they were gone within a few days. And while I can’t say for sure that I’ll make these again, I may change my mind when keeflee season arrives. This week’s recipe for the Modern Baker Challenge was a quick, easy dessert. 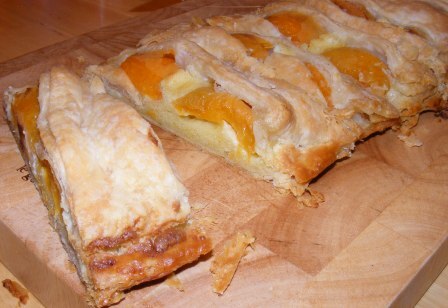 It consisted of puff pastry with an almond paste filling and apricots. I decided to make this for dessert the other evening about 10 minutes before dinner went on the table. And I had it in the oven before we sat down to eat. 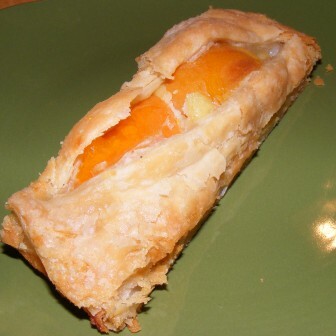 I rolled out the pastry dough, mixed the almond filling with the Kitchen Aid mixer, and drained a can of apricots. 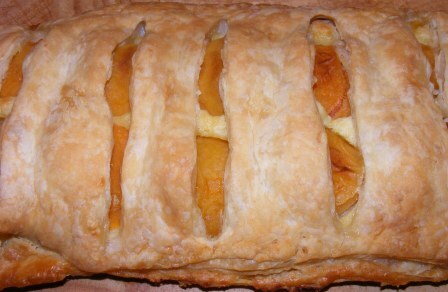 I spread the filling over half of the dough, then topped it with apricots. 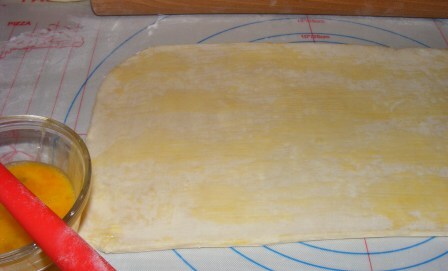 I slit the top dough, placed it on the strudel, and pressed it in place. I fluted the edges with the back of a paring knife, and it was ready to bake while we ate dinner. By the time we were done eating, the strudel was ready to come out of the oven. 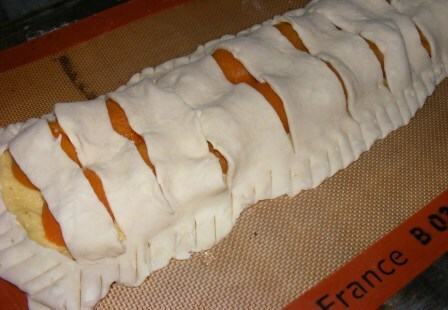 I set the strudel on a rack to cool while we cleaned up the dinner dishes; then we cut into it. We all enjoyed this strudel. The puff pastry was, of course, rich, buttery, and flaky. 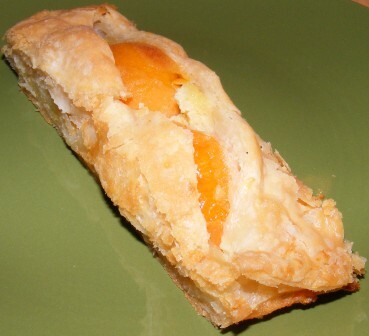 The almond filling was delicious and paired well with the slightly sweet, slightly tangy apricots. This was a perfect weeknight dessert. Easy to throw together at the last minute, and absolutely delicious. And, hey, it had fruit in it, so it must have been good for us, too!